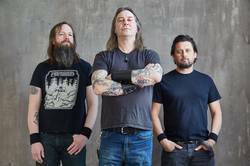 On Oct. 5, High on Fire return with Electric Messiah, set to release on eOne. The album title is an homage to Lemmy, as the band's Matt Pike has faced numerous comparisons over the years and wanted to pay tribute while separating himself from the icon. The band last released Luminiferous in 2015. SPB had the pleasure of catching them live in Sydney in 2016.